Liz Mugavero is a writer determined to make a living with her writing. Right now, she works in marketing and writes at night (she’s been writing since high school). Based on the mystery series she’s writing, the Pawsitively Organic Mysteries, I’d guess that she’ll succeed. I read A Biscuit, A Casket, which has a Halloween setting in the otherwise charming Connecticut town of Frog Hollow (sadly imaginary, I think). It’s actually the second book in the series followed by The Icing on the Corpse, which came out earlier this year. The first, Kneading to Die, is an Agatha Award nominee, and shows how Stan got to Frog Ledge and turned into a pet chef. I had a few questions for her about how she came to write the series. She will also be part of the New England Crime Bake, a crime-writing conference in Dedham, Mass, from November 6-8 for those of you who can make it. LM: Thanks for having me here, Gabi! And so glad you enjoyed Biscuit. .Sisters in Crime New England is the reason this series was born. My agent, John Talbot, contacted then-president Sheila Connolly looking for writers to develop cozy proposals. She put the call out to the entire membership and I was one of the writers who responded. We talked about my interests and how we could turn that into an idea that would sell and came up with gourmet pet food. I wrote a proposal and it sold less than two months later, and that was where it all started! GC: Writing a series must be a little like writing a soap opera, in the sense that you have to have an underlying storyline that continues from book to book. How hard has it been to come up with a cliff-hanger at the end of a book? LM: I’ve spent a lot of time thinking about Stan’s character arc – to me, it’s just as important as the mysteries. So as Stan makes the transition from corporate girl to taking ownership of her business and her life in ways she never really has, she’s growing and changing all the time. She’s looking very closely at relationships in her life, ending some, making new ones, revisiting family issues. The cliffhangers have come from those explorations, and to my delight they’ve manifested quite nicely in each book (so far!). GC: I know you have another career that must take up quite a bit of your time. How on earth do you find time to get the books written? LM: That’s a great question! I’ll let you know when I figure out a good answer…. I am on a constant quest to improve my time management skills, and also to be more of a plotter than a pantser. (For those of you not familiar with the terms, plotters plan out the book in advance while pantsers write into the headlights!) I’ve gotten better at that, mainly because deadlines are a great time management boost, but also because I discovered a fabulous book about plotting that’s changed my life. Plot Perfect by Paula Munier – if you’re a writer, buy it! It gives you an easy-to-follow guide to creating your story that makes a ton of sense. I can’t recommend it enough. And even for a pantser like me, sketching out the big picture has made a big difference in focusing my time and attention. GC: Who writes the recipes for the pet treats? LM: For the first book, I muddled through the recipes. I didn’t love it, largely because I felt very time-crunched because of the reasons above. Then as I was getting into the second book, fate brought The Big Biscuit into my life. It’s a pet food bakery in Franklin, MA and the owner at the time agreed to become my consultant and provided me with recipes. When he sold the business to his baker, she agreed to keep up the tradition. The treats are lovely and I know they’re healthy, just like Stan wants! GC: Your heroine is called Stan. How did you come up with that name? And, of course, what’s in store for our heroine Stan in the future? LM: In a previous iteration of my day job, I was asked to do a colleague a favor during a business trip and get a video of someone in a field office. My colleague didn’t tell me anything about this person, just to “call Stan.” When I called Stan, I expected an older, balding man smoking a cigar on the other end of the line. Instead I got a young blond woman, and I thought, Wow! What a great nickname for a woman to catch people off guard. So I stole it! In the future, I expect to see Stan evolving more as her own person and businesswoman. 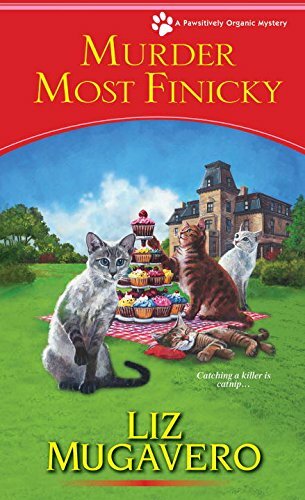 In Murder Most Finicky, coming out in December, she’s still navigating the idea of what working for herself looks like after a celebrity chef sets his sights on her as the next big thing. This book was a lot of fun to write. Stan’s stepped out of Frog Ledge in this one, and takes a trip to her home state of Rhode Island where her family is unexpectedly involved in the murder that unfolds. Stan will also continue to figure out her personal relationships, both with her family and with Jake. I’m excited to see how that will evolve as she starts to take down the carefully-constructed walls she built over the years to focus on external success. She’s really come a long way. I’m proud of her! Love these interviews. Wish I weren’t such a pantser! Haha – me too! Thanks for reading!